It's only seventy-five. But standing out on my tiny balcony in jeans and a black 3/4 sleeve sweater I wore to church this am, the sun beating down on you produces some serious heat. And I did this all for you. All for you, my faithful readers. I thought I'd try to show you some true colors. It worked. Well, sort of. First up, Knitpicks Shadow in Oregon Coast to work up the lovely Mary Jane. This picture still doesn't do it justice. 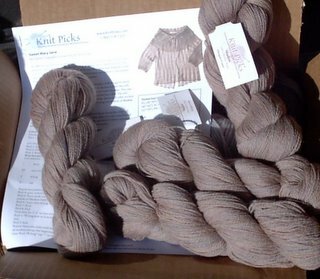 It's a grey heathered yarn, with all sort of pretty flecks in it. I think the Mary Jane will be just lovely. Although I need some new needles for it. It uses three types of size 6 needles. 16" circs, 32" circs, and dpns. I'm tempted to hope that I get gauge on size 5, because at least with that, I have two of the specified types. Oh well. 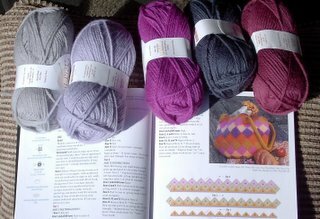 Next up, wool of the andes for the Market Sqares Bag. Two problems. I read "hush" as "blush" and thought it was pale pink. It's not. It's hush and it's pale lavendar. But I can work with that. I'm not sure the tulip is gonna fly. It's screaming zonkers magenta/fuschia. I'm tempted to edit the pattern to not include the fifth color. I also had an idea to whip up a striped or entrelac bag of my own that would be perfect for church, to carry a bible, a small wallet, a pen, and a lipstick - you know? Don't know yet about that.